"Whether you’re already running an information business or just starting out, this book is an invaluable resource. Mary Ellen Bates has done it again!" 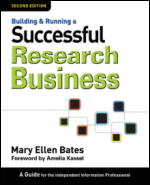 This is the handbook every aspiring independent information professional needs in order to launch, manage, and build a research business. Organized into four sections, "Getting Started," "Running the Business," "Marketing," and "Researching," the book walks you through every step of the process. Author Mary Ellen Bates covers everything from "Is this right for you?" to closing the sale, managing clients, promoting your business on the web, and tapping into powerful information sources beyond the web. The second edition features a wealth of new material, including new chapters on how to position yourself, marketing via social media, creating an effective web presence, strategic planning for your next five years, and writing a marketing plan that works. Bates, a popular author and speaker and a long-time successful independent info pro, reveals all the tips, tricks, and techniques for setting up, running, and growing your own information business.